We know your child's learning needs are unique to them, and we know they will learn in many different ways. We believe that at the heart of effective personal growth and development (which is synonymous with behaviour education/ management in the school setting) the building of caring and supportive relationships among students, teachers, parents and caregivers is essential. With this in mind, our behaviour education policy is designed to support students to develop both the capacity and the willingness to take personal responsibility for their actions and behaviour. This involves making sure that our expectations of students are clearly stated to all concerned as well as working closely with parents, caregivers and students to solve issues if and when they arise. At St John the Apostle Parish School, staff and students are encouraged to be committed to lifelong learning that is relevant, enriched and passionate, and which uses the best of learning energies for everybody. This supports the understanding that learning is an individual, as well as a shared experience and that ultimately, the need for learning is the whole reason 'school' as we now know it came into existence. These reading behaviours are not used or learned in isolation and are explicitly taught in R-7. They are also essential skills for students to develop as writers and spellers. 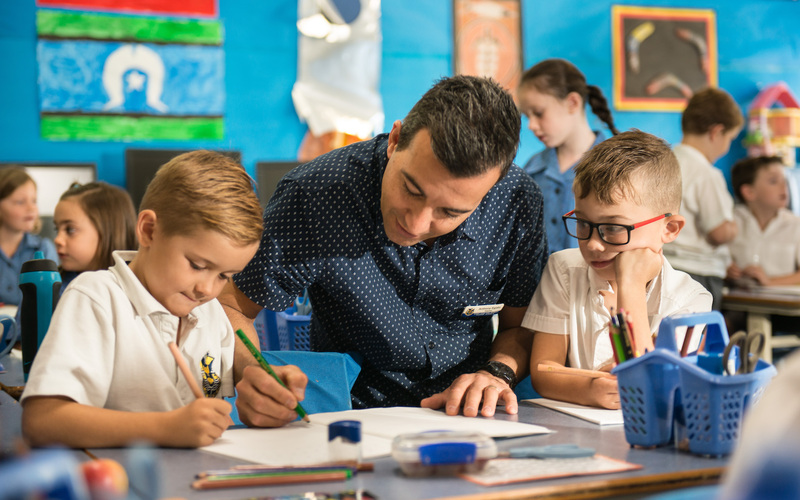 Read on to discover the key programs we use across the school to develop the literacies of our learners and to maintain consistency across all year levels. Jolly Phonics is a systematic, sequential, phonics program designed to teach children the 42 sounds of the English language. Students are then taken through the stages of blending and segmenting words to develop reading and writing skills. In this program students develop phonemic awareness through a variety of activities and to hear sounds at a very early age. The Jolly Grammar program continues on from the Jolly Phonics with spelling and grammar strategies that further reading development. R-4 students benefit most from this program. Each of these key comprehension strategies are taught explicitly and developmentally. A curriculum map with a continuum of learning is currently being developed. Being able to automatically recognise a range of words supports reading development. Once students can do this, learning to spell the words accurately assists them as writers. The Oxford Word list (OWL) has been developed from researching the most common words used in the writing of more than 4000 Australian children. It has been selected as the sight word resource for all our R-7 learners. More information can be located at www.oup.com.au or by speaking to your child’s teacher about the lists being used in their learning area. OWL resources for assessment and instruction are available R-7. A minimum of 300 minutes per week of explicit literacy instruction in all 3-7 learning areas.